Spotify just announced the addition of 2.5 million paying since mid November to reach 15 million total subscribers. This is unprecedented growth not just for Spotify but for the subscription market as a whole. It also comes at a time when Spotify needs the best possible numbers to keep labels on board during its crucial renegotiations. But what is most interesting is what the growth tells us about pricing. Long term readers will know that I firmly believe there is a watertight case for reducing the price of subscriptions. Only about 10% of music buyers spend $10 or more a month on music (across all recorded music formats) and most of those have already been converted to subscriptions. While there is absolutely a case that some consumers can be ‘educated’ to spend more on music, in just the same way cell phones educated them to spend more on telephony, many simply will not because there are such compelling free alternatives. Of all of those the 0.99 for 3 months holiday promotion had the biggest impact. There is an argument that customers acquired this way are effectively monetized trialists and it is highly likely a large share, perhaps even the majority, will not continue to pay after the promotion is ended. But that almost misses the point. 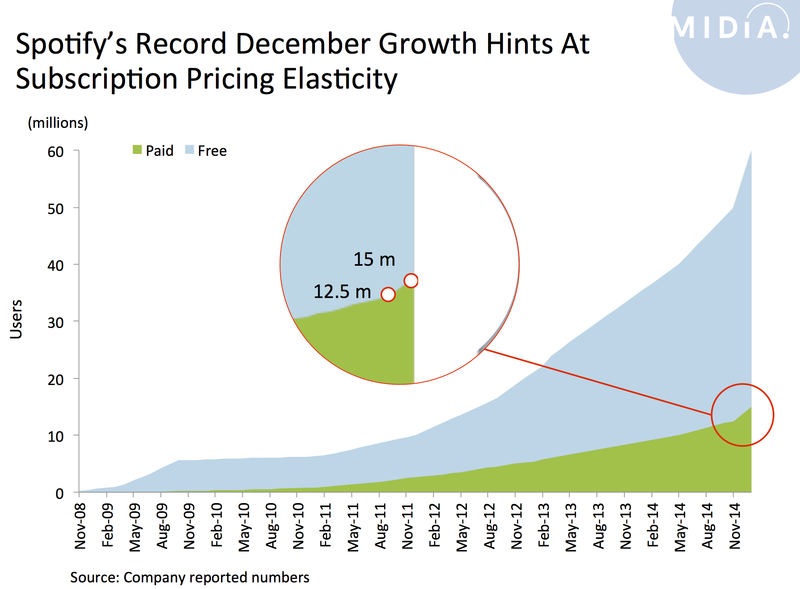 What the surge in adoption at lower price points shows us is a purer measure of the demand curve for on demand subscriptions, without the distortion of the 9.99 price point. Of course 0.99 is not a feasible long term price point but 4.99 is, or perhaps more realistically for now, 7.99 is. Some of those trialists will unsubscribe after 3 months, some will forget to unsubscribe and some will decide that 9.99 is actually pretty good value. The net effect for Spotify will be more subscribers than it would have had without the campaign. The stellar growth is also intended to catch the eyes of various other vested interests. For investors ahead of a potential IPO these numbers help show that Spotify may have its best days ahead of it. For labels this, ‘conveniently’, creates the best possible numbers for them to consider during contract negotiations. And for Taylor Swift it shows that for all her windowing antics Spotify grew faster than ever. In fact, the wall-to-wall media coverage of the ‘Swiftify’ debacle actually boosted Spotify’s profile and may even have modestly helped the numbers. 2015 will be a huge year for Spotify with the super heavyweights Apple and Google both playing their subscription hands and with growing label concerns about the freemium model. It would be naïve to suggest Spotify will not feel the pressure of those factors alongside the continued growth of competitors such as Rhpasody, Rdio and Deezer. But starting the year with 2.5 million new holiday season subscribers is about as good a start as Spotify could possibly have hoped for.